We are scanning disc film using a Creo iQsmart 3 museum grade scanner at high bit depth and ultrasonically cleaning film before scanning. Images produced exceed the quality of the original prints. With some confidence, we can say there is no other provider that can approach this level of quality with a disc film scan. Ultrasonically cleaned — We don’t use an infrared dust removal system such as Digital Ice or Image intelligence. Dust removal is done manually to eliminate the artifacting that can be created by IR dust removal when scanning such small images. We do use IR on larger negatives…It just doesn’t work well on tiny negatives. Spotted digitally for any remaining dust or scratches. Please note, negatives in very poor condition may still have some damage remaining. Scanned at 5500 DPI 48 bit — Enough resolution to capture all the detail in the small negative and enough bit depth to salvage detail from the highlights and shadows. Cropped by eye precisely to the edge of each image revealing about 15 percent more of each picture than the original prints made from the negative (See the sample image below). Opened in Photoshop CC™ and adjusted for, brightness, contrast, highlight recovery, shadow detail and color. Photoshop CC™ is the professional standard for uncompromising image correction. Both 48 bit Tiff and 24 bit Jpeg files are returned to the client. The red line that you see in this sample photo, indicates the approximate amount of cropping that would have been done to your pictures when the original prints were made from your disc film. At Film Rescue we do our crops by eye precisely to the edges of the frame. This reveals more of the original picture and means that the grain is reduced because it is then essentially a larger negative. Note about printing: Our prints are offered as a convenience. High quality prints can be provided by a reputable local supplier once you have the scans back from us, at a lower cost to you. Our prints are a vintage style print with wide quarter inch borders on glossy paper. 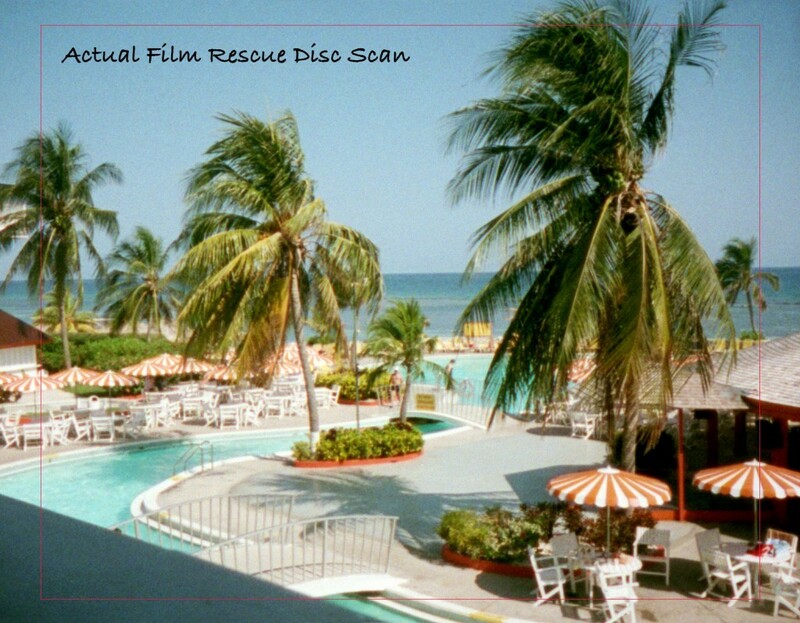 Please note: To optimally scan Disc film we need to remove the central hub of the disc. The hub at this point serves virtually no practical purpose. This is the default approach. It is possible to leave the hubs in if it is important to have the disc remain in their original state but the images won’t be quite as sharp. Please make that request by hand on the order form. When applicable, VAT, GST and/or PST will be added to European and Canadian orders. Minimum charge may be billed before processing, especially on orders with multiple films to process. **Film Rescue Europe orders must be sent to and returned through the Netherlands location. * Shipping charges may be higher for exceptionally heavy, large, or fragile orders. Work is in house from 2 to 6 weeks depending on our workload. You may request we attempt to be on the shorter end of that.